KUALA LUMPUR (Sept 19): AirAsia Bhd has set up a subsidiary in Singapore, which will enable it to provide airlines operation services and aviation related management services in the country. According to its bourse filing today, the low-cost airline said it has incorporated AirAsia Pte Ltd (APL) as a wholly-owned subsidiary in Singapore via its unit AirAsia Investment Ltd last Friday (Sept 16). "The principal activity of the company is airlines operation services. In the course of its business operations, the company will also act as a management services company dealing with relevant authorities and service providers in Singapore," it added. APL has an issued share capital of S$1 million (about RM3 million), comprising 1 million shares of S$1 each. The directors of the company are Tan Sri Dr Anthony Francis Fernandes, Datuk Kamarudin Meranun and V Loganathan Velaitham. "The incorporation of the company is not expected to have any immediate effect on the issued and paid-up share capital or substantial shareholders' shareholdings of AirAsia," it said. 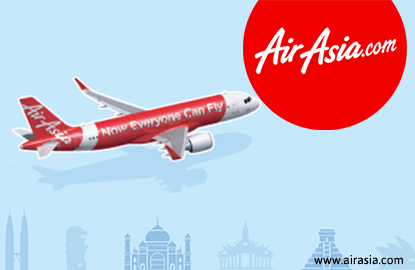 Shares in AirAsia closed down five sen or 1.74% at RM2.83, giving it a market capitalisation of RM7.87 billion.